MAPS: Shotton in County Durham, and Skipton in North Yorkshire, England. Incurious minds may skip the first three paragraphs. It passeth all understanding why we have never introduced you to Terry Smith's 'Shotton Lad' web site, otherwise known as 'Tel's Interesting Trekking Scenes'. We are on the mailing list, visiting faithfully on every email alert of an update, and thoroughly enjoying ourselves when we do visit. We thought some explanation might be in order for anyone born anywhere outside a 100 miles radius from Durham City in north east England, and/or visitors who do not involve themselves in the esoterics of web design. The diminutive of Terry is 'Tel', and Shotton is, or at least was when Britain still had a coal mining industry, a famous mining town. Terry's web site uses the masked URL forwarding www.Get-Me.To/Tel, whereas we prefer the genuine article, which points to the web server www.ShottonLad.plus.com where the files are really located. If this was merely another of our fiercely defended though idiosyncratic personal preferences we might hesitate to mention such things, but we will be using our preferred format to ensure that as long as Terry's pages remain in the same place on his web server, you will be able to visit using our URL, even when the content at the masked forwarding URL changes. We thought enquiring minds might wonder at some of the URLs that were appearing in their browser location bars. The web is smoke & mirrors at the best of times, so please forgive this technical digression provided for your comfort and convenience. Normal programming will now resume. 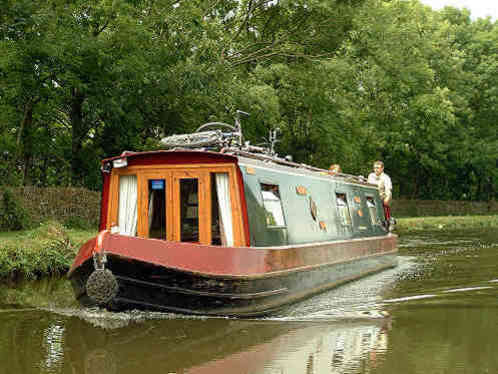 Terry's latest update features narrow boats on the Leeds-Liverpool navigation canal at Skipton. Today much of the canal system is maintained for heritage reasons, and used mostly for leisure purpose, although there is still some commercial usage. The men who labored to build the canals became known as navvies, a word that has survived to mean someone performing intensive labour, especially if digging is involved. Intensive it must have been, because essentially the canals were hand dug, with some horse assistance but even less mechanically powered assistance. Many of the navvies and other labourers were immigrant Irish men and women, which led to the assertion that the wealth created on England's soil was founded on Irish toil. Such was the impact of this influx of people, and the work they performed, that as late as the second half of the 20th century mechanical excavators were still known as navvies in the construction plant business. The birth of the world's first Industrial Revolution was ushered in by a period of intense canal building that held the seeds of its own demise: industrialization brought with it steam motive power and the birth of the railway system, which rapidly superseded the canal system as the dominant force in transport. Today the waterways are busy again, but with a different purpose, for a different class of users. American musician (1901-1971). It is difficult to give this man a place in the history of American music, because in many ways he was the history. Anyone who is a Ken Burns movie, and a Jazz 101 academic course, has to be attention worthy. If a mainstream movie cast list reads 'as himself' then that clinches it for us. For most of his life he gave 4 July 1900 as his birth date, but many years after his death a birth record was found establishing the correct date as 4 August 1901. Evidently we share similar life experience with this man, who said, "There's some folks that if they don't know, you can't tell 'em." Sadly, that is so true. After several days spent digitally surfing up and down the Missouri River in search of the 'Mountain Men' of the Old West, I decided to look to my homeland for some modern mountain men. The man in the picture is Jos Naylor, who is known as 'The King of the Fells', the latter being the local word for mountains. This picture was taken by blog favorite Andrew Leaney, as 66 year old Jos stormed past, during the 'Wasdale Fell Race' around the hills of Jos' home valley. You may see the sort of terrain that the course runs over, by visiting Andrew's web site, 'Leaney's Lakeland Fells', in the entry for Saturday 13 July 2002. The Wasdale 21 miles, with 9,000 feet of ascent over rough country, is just a stroll for Jos Naylor, however. To celebrate his 60th birthday, Jos ran the 60 highest Lakeland peaks in aid of Multiple Sclerosis research. The run was almost 110 miles long and involved nearly 40,000 feet of ascent - the equivalent of running from sea level to the summit of Everest one and a half times non-stop! StridingEdge has an extended video of an ITV documentary that uses both spectacular dynamic aerial photography and action taken by static film crews deployed on the high summits, to record the historic run. When Jos was younger at the age of 35, and 'lisher' as they say in those parts, he set a record of 63 peaks, 92 miles, and 35,000 feet of ascent in inclement weather. There can be few athletes, if any, who in their sixties have broken the records they made in their thirties. The Karrimor International Mountain Marathon (KIMM.com) web site has a photo gallery of fell runners in action: Jos appears in one of the shots. Some members of the band 'Chumbawamba' (appearing as a one recording band called 'Sportchestra') even recorded a song in homage (see Track 69 'Jos'). Jos is a member of the Cumberland Fell Runners club. Another runner to take up a challenge is Steve Vickers with his Project244, which is turning into a comprehensive photo gallery of many of the Lakeland fell tops. My informants tell me that if you hang out in the bar at the Santon Bridge Inn at Wasdale, you may come across 'The King of the Fells', and if you are lucky enough, you might even get to buy him a glass of the amber nectar!